America’s favorite sports, in some order: football, baseball, basketball, politics? A recent study has found that a significant percentage of Americans with partisan leanings care more about their political party winning an election -- or maybe more accurately, beating the other party -- than about seeing the policies that their party supports put into law. And that goes for Democrats and Republicans alike. The researchers looked at survey data from the 2010 Cooperative Congressional Election Study for the paper, "Red and Blue States of Mind: Partisan Hostility and Voting in the United States." Within it, they found 41 percent of people with strong partisan feelings said winning was more important than the what the victory would actually mean for society, while 35 percent said particular policies were a more important factor. The other 24 percent valued both equally or had no real opinion. In other words, a lot of Americans view politics more as just another sport than as the selection process by which we choose the men and women who will decide the rules that govern so many aspects of our daily lives. Earlier studies have already found that Americans view politics as something resembling a sport. But this study went one step further, uncovering evidence that hate for the other side of the political aisle often isn’t so much based on opposing values and political positions, but on loyalty to the party itself. In essence, Democrats and Republicans hate one another for the same reason Los Angeles Lakers fans and Boston Celtics fans despise one another -- not because of the values the other holds, but simply because they are supporters of the rival team. “Too many partisans are saying, 'My side is good; the other side is evil. We have to go beat them,'" Patrick Miller, a co-author of the study and assistant professor of political science at the University of Kansas, said in a release. "They're our rivals, like Kansas or Missouri, Duke or North Carolina. And that sense of animosity and demonization is really motivating average partisans to participate in politics, much more so than issues or ideology." This is problematic, especially in a representative democracy based upon the idea of civilly discussing the issues of the day with one another. (LOL.) The idea that so many Americans view politics with an us-versus-them mentality and without significant regard for what us and them really want appears to be leading to some issues. Thirty-eight percent of partisans agreed that their parties should use any tactics necessary to “win elections and issue debates.” When those who agreed with this view were asked what tactics they had in mind, the most common ones they offered were voter suppression, stealing or cheating in elections, physical violence and threats against the other party, lying, personal attacks on opponents, not allowing the other party to speak and using the filibuster to gridlock Congress. Democrats and Republicans were equally likely to express this opinion. Catch that? Roughly two-fifths of the nation appears to be alright with voter suppression, cheating, lying and violence or something similar just to help out their party’s political chances. Two-fifths are willing to threaten the roots of American democracy for the sake of winning, and what they're winning doesn't exactly matter. Asked whether the rivalry could have developed out of underlying philosophical differences born early on, Miller said it's possible, but not a real excuse for the state of animosity that exists today. This is not what the Founding Fathers were hoping for when we set this baby up more than 200 years ago. We’re supposed to hash things out like adults and find points of compromise, not consider inflicting violence upon one another in the name of getting a political candidate on stage to dance to some ‘70s rock icon’s anthem for a night. It hasn’t always been so intense. In fact, as recently as a decade ago, the country was significantly less divided by political party than it is today. 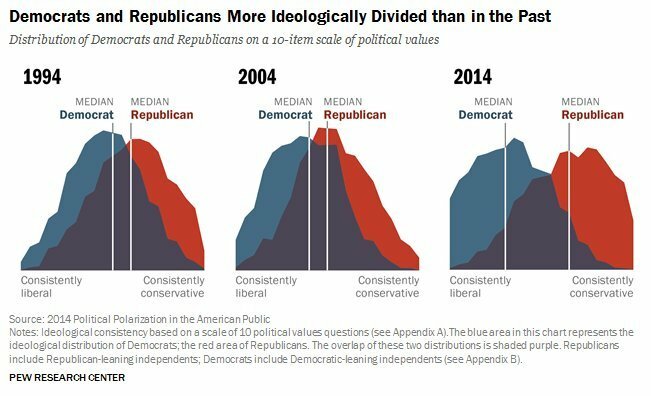 A 2014 report out of the Pew Research Center found that the two parties are now much, much more “ideologically consistent,” meaning they adhere to the party line much more so than they did in 1994, or even 2004. This growing divide between Democrats and Republicans can be seen every day. It's the conversations between two talking heads yelling and no one listening on TV. Or the political ads that are heavy on narratives and short on policies. Or your uncle who doesn't like that one political candidate, not because of his stance on regressive tax policies, but because he just doesn't like his look, you know? "What is the consequence of today's polarized politics? What's motivating partisans to vote in this climate?" Miller said. "For too many of them, it's not high-minded, good-government, issue-based goals. It's, 'I hate the other party. I'm going to go out, and we're going to beat them.' That's troubling." "Red and Blue States of Mind" was co-authored with Pamela Johnston Conover, a distinguished professor of political science at the University of North Carolina at Chapel Hill. It was published in the peer-reviewed Political Research Quarterly.